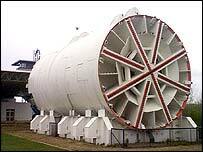 A huge boring machine used to build the Channel Tunnel that links the south of England and France has been sold by online auction site eBay. The 580-ton drill went for £39,999 to a bidder using the name steddenm. The price does not include delivery. The auction started on 2 April but faced problems last week as it was peppered with hoax bids of up to £10m. By Sunday, eBay said it had removed or cancelled all but 59 offers and had put a vetting process in place. The auction closed on Monday at 1715 BST with a total number of 65 bids. Money raised from the sale is to be shared between three charities chosen by staff from Eurotunnel, the company that operates the underground rail link. The charities are Macmillan Nurses, Demelza House Hospice and Pilgrim's Hospice. According to the eBay listing, the drill "removed a half million cubic meters of chalk and soil in creating the Eurotunnel route" and is "a prized relic from the greatest construction achievement of the 20th century". The write-up suggests it would be of interest to science museums or "technical enthusiasts around the world". Buyers need to be pretty sure of what they are purchasing, however, because Eurotunnel states that returns are not accepted.